Our Le Mans 24 Hours VIP suite hospitality package offers you full VIP hospitality in a track-side private suite, with privileged access to a professional race team. For the 2017 24 Hours of Le Mans we can offer you a fantastic track-side hospitality suite, located near the Reccorement Corner, with exceptional views of the last two chicanes. This executive suite, consisting of 2 floors, include a second floor terrace with a full bar, offers you panoramic views of the Le Mans 24 Hours Circuit. 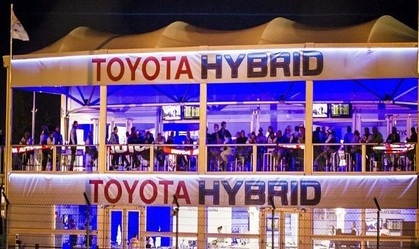 Our 24 hours of Le Mans VIP guests experience included access to a private balcony overlooking the Toyota LMP1 team pit garage as well as a guided tour of a pit box and introduction to a race team. Our Le Mans 24 Hour VIP hospitality packages include full track-side suite hospitality, guided team pit box tours as well as a team introduction. You will also have access to all the interactive activities inside the hospitality suite as well as free access to the 24 Hours of Le Mans museum and public pit lane walks on both days. 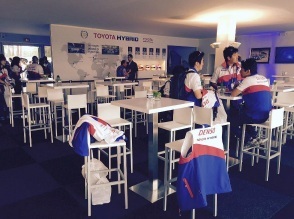 The recommended dress code for the 24 Hours of Le Mans hospitality suites is smart casual attire, i.e. long trousers and a polo shirt for men. 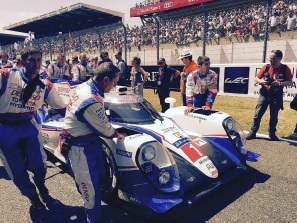 Most Le Mans 24 Hours hospitality suites and terraces requests that no track suits, shorts or beach attire be worn. * Please note: All the 2016 Le Mans 24 Hours hospitality packages for the suites above are payable in full on booking.